The menopause directly affects nearly a third of Severn Trent’s female workforce – and has an indirect impact on all its staff – yet, for years, its symptoms and effects were regarded as taboo and not to be talked about. But with more people working for longer, it’s becoming a pressing issue for all employers; a survey by ITV’s Tonight programme, in collaboration with charity Wellbeing of Women, revealed that two-thirds of women going through the menopause have no support in place at work, and a further quarter of women currently experiencing the menopause had considered leaving their job because of their symptoms. The “increasing age” of Severn Trent’s 6,200-plus staff means “more women are experiencing menopausal symptoms at work”, says Saimbi. But it was a steep mountain to climb to make women feel comfortable discussing their experiences with line managers and colleagues. 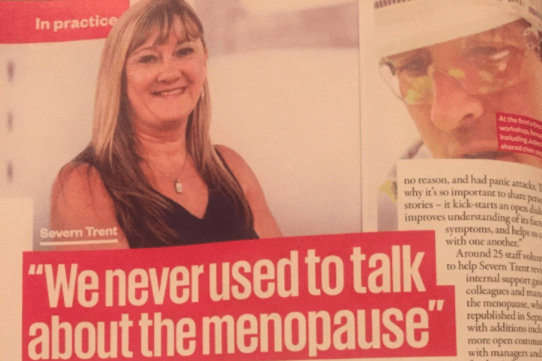 The organisation broke ground by hosting a workshop at its Coventry headquarters in July to open up conversation about the menopause, with experts on hand to share information and outline the support available. Around 90 guests attended, including Severn Trent employees and representatives from fellow water companies – and seven men. Around 25 staff volunteered to help Severn Trent review its internal support guide for colleagues and managers on the menopause, which was republished in September with additions including more open communication with managers and access to further information. Employees are also being encouraged to discuss their menopause, see their GP if needed and request adjustments – such as flexibility around break times, and extra consideration around work wear and temperature control – if necessary. “We want our leaders to know more about the issue, be clear on our support guidelines and feel confident in having great conversations with staff.” says Saimbi. With almost all staff (96 per cent) who attended the preliminary workshop saying it made them feel more confident discussing the menopause, the company has since hosted half-day events on the topic, and is planning to hold regular awareness events throughout the year. It’s also considering broadening support and discussions to cover issues such as fertility and miscarriage in the future. “The events have become part of our core HR offer, linked to our wellbeing and mental health strategy. We’re aiming to create a culture of complete openness; we want to make sure our employees have the knowledge and support they need, when they need it most,” says Saimbi.